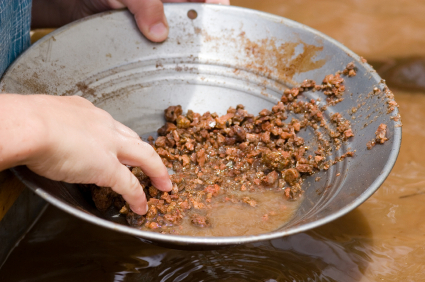 Gold panning separates small flakes of gold from large quantities of sand. In a similar way, in the front end of product development the “gold” of customers’ latent needs can be separated from an overburden of core needs. Finding latent needs provides a route for a current technology platform to move to new growth through innovations that solve latent needs’ hidden problems. Recognizing and surfacing latent needs from core needs requires insightful conversations with customers for your new product. Scan markets — existing, adjacent, new — where product developers have found “gold”. Once you’ve located a gold-bearing stream find crevices or niches where the latent needs tend to concentrate. Decide which market niche your new product concept, in combination with your existing innovation levers such as R&D and market insights, might best exploit a latent need. Assemble a random sample of lead users, early adopters, and end users in this market niche. Interview at least 40 individuals in the sample in one-on-one conversations. Guide the conversations to elicit the problems and challenges they face. Often after an individual in the sample gives a long list of core needs, then some of the hidden problems and frustrations settle out. Patterns begin to unfold as these latent needs concentrate. Before developing a third technical solution for the top core need, the client engaged me to research the adjacent market and get feedback on latent and core needs the solution might solve. I found after 40 elicitation interviews with customers and their end users that the end users didn’t care a whit about the customers’ top core need. Surfaced and concentrated however, was a latent business need. The client resolved this need by switching to an innovative business model for the adjacent market. In the past fourteen years the client’s market share increased from 6% to 65% in a >$40 mil./year global business . Since 1985 I’ve used phone interviews to find latent needs and valid market opportunities for clients with new product concepts for B2B markets. Call me at 203/323-4075 to start a conversation about how we might work together.